I hope you have all been good so Santa will come and leave some awesome presents for you tonight. 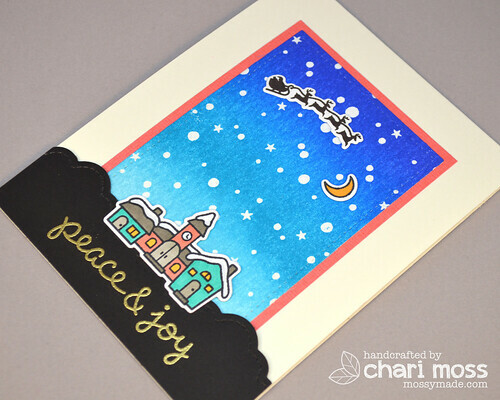 :) Today's card is perfect for Christmas Eve and Santa's flight! I love the little village and silhouette of Santa's sleigh in Ready, Set, Snow. I like even more that you can use them without the snow globe too. I embossed the Snowy backdrops with clear embossing powder on distress watercolor cardstock then blended the sky with tumbled glass, broken china and blueprint sketch distress inks. I used the puffy cloud border die to cut the ground and used gold embossing powder for the sentiment. The images are colored with copic makers and cut with the coordinating dies. How great is it to have a die to cut out Santa and his sleigh! Thanks for stopping by today! I wish you all a Merry Christmas Eve, we will be spending the evening with family. 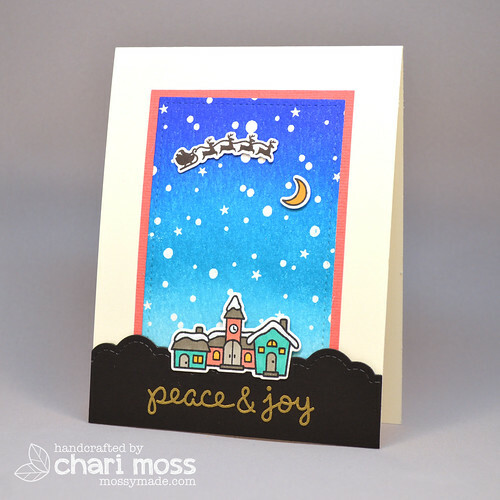 Beautiful card Chari! and a happy Christmas eve to you also. May your Christmas be filled with lovely memorable moments. Very pretty card! Merry Christmas!